TRL/CPCC Acc. PC-ON 14 The Highland Inn, Algonquin National Park of Ontario. Grand Trunk Railway System Winter Hotel. TRL/CPCC Acc. 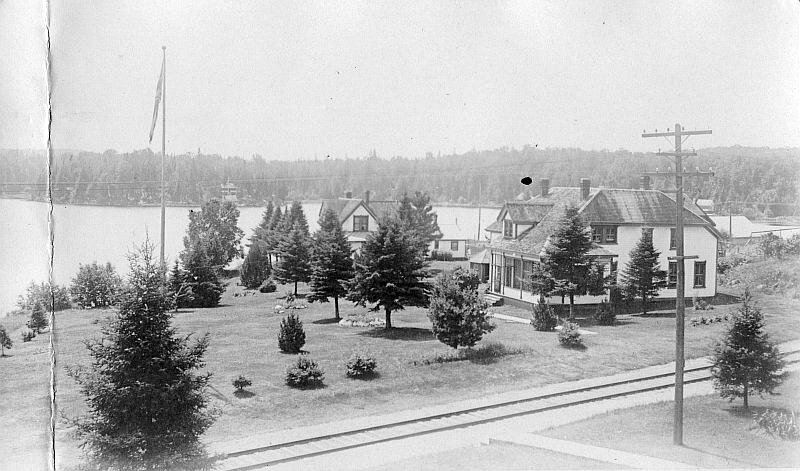 PC-ON 15 The Highland Inn, Cache Lake, Algonquin Provincial (Ontario) Park. TRL/CPCC Acc. PC-ON 23 Headquarters—Algonquin National Park of Ontario. Grand Trunk Railway System. 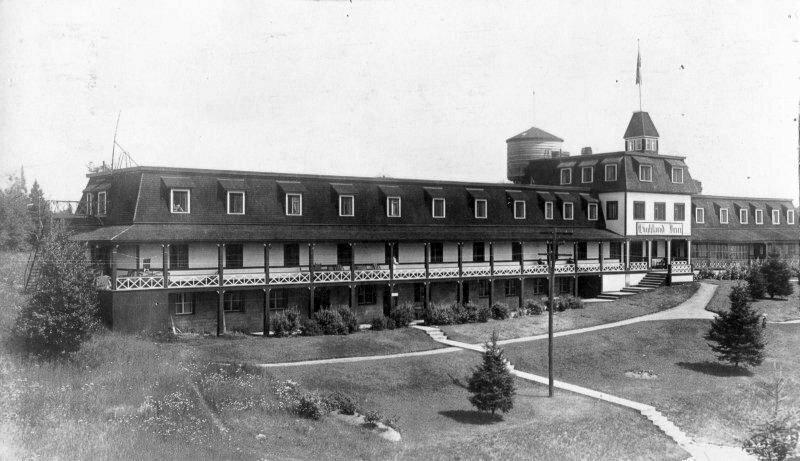 APMA / 1726 Boarding house and Highland Inn. JPS collection Postcard view of station from the verandah of the Highland Inn. Published by Friend of Algonquin Park, Box 248, Whitney, Ontario K0J 2M0. Not postally used. William James Topley / NAC / PA-010570 Highland Inn and GTR station from a distance. William James Topley / NAC / PA-010572 Highland Inn and GTR station from a west. 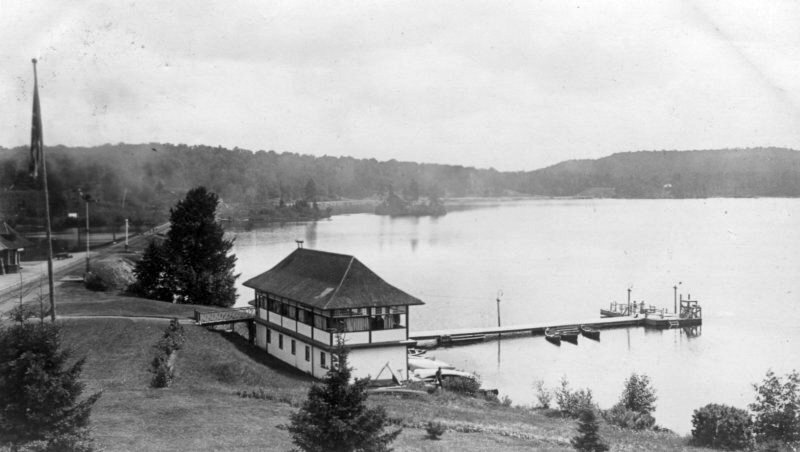 JPS collection Postcard view of boathouse and dance pavilion taken from Algonquin Park Headquarters. To the left of the photo is the station and train order semaphore signal, which was located on the opposite site of the track from the depot. Postmark obscured. 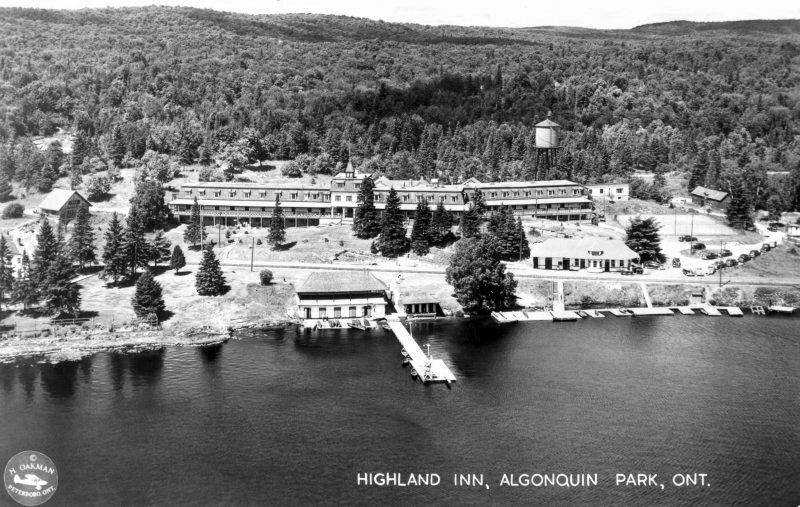 JPS collection Postcard view of Highland Inn probably taken from the Algonquin Park Headquarters. JPS collection Postcard view of headquarters building from the Highland Inn. Postally unused. 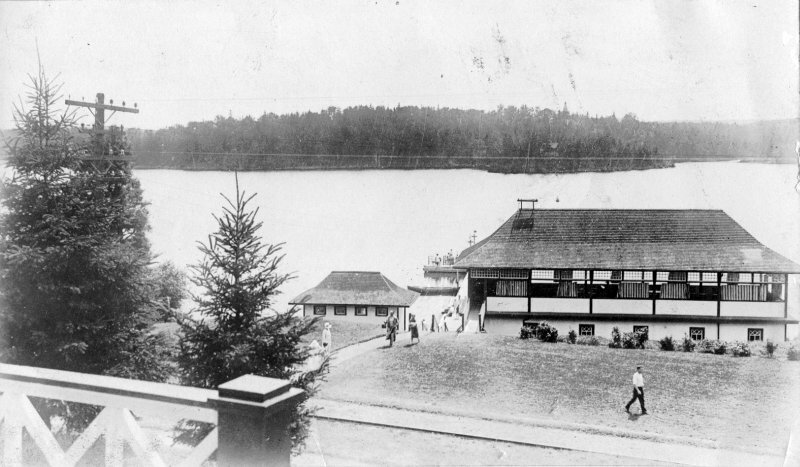 JPS collection Postcard view of boathouse and dance pavilion taken from veranda of Highland Inn. Postally unused. 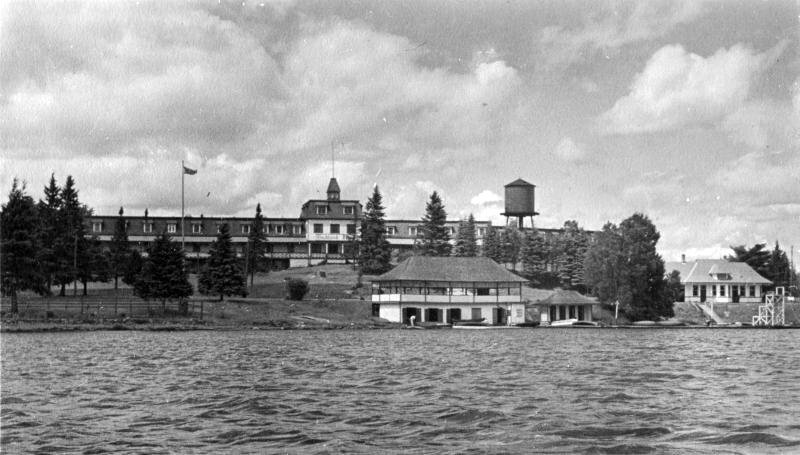 Unknown Boathouse and Highland Inn. CN Photo Collection / CSTM / Image CNxxxxxx View of station and platform from stairs leading to Highland Inn. CN Photo Collection / CSTM / Image CN002812 Boathouse and Highland Inn. CN Photo Collection / CSTM / Image CN000138 Station area from Cache lake. 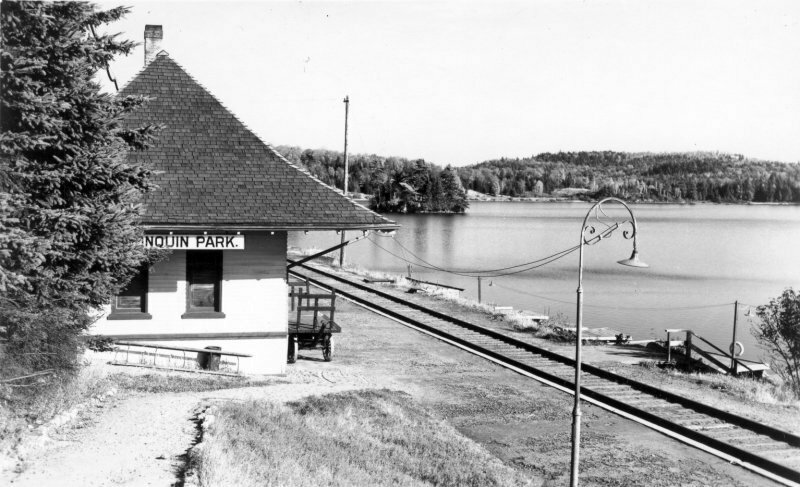 Wentworth D. Folkins painting Algonquin Park Station-1935. Postcard published by Heritage Railroad Editions, Mt. Brydges, ON. Not postally used. JPS collection Postcard aerial view of Highland Inn. Canadian Post Card Co. Ltd., Toronto. Postmarked August 23, 1951 Algonquin Park. JPS collection Postcard view of depot from path leading to Highland Inn. AnnaBelle Studios. Postally unused. J.J. Klawe Photo/JPS collection Postcard view of Highland Inn. Photo Graphica, Toronto. Postally unused. 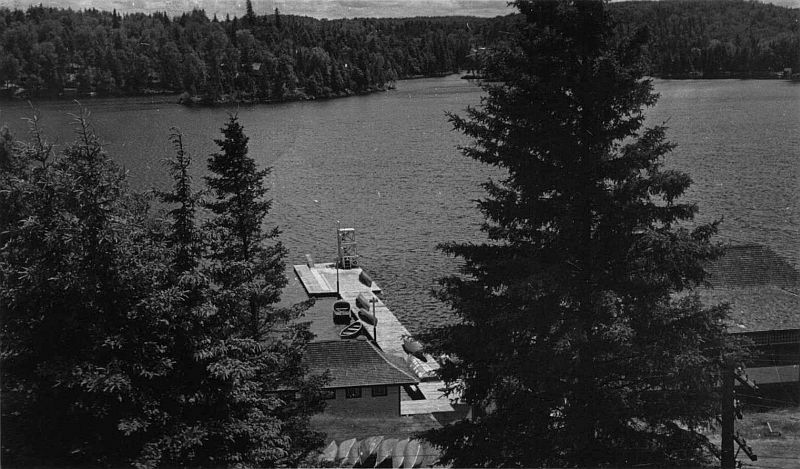 J.J. Klawe Photo/JPS collection Postcard view of Cache Lake from veranda of Highland Inn showing rear of depot and dock. Photo Graphica, Toronto. Postmarked Algonquin Park, 1951-08-26. James A. Brown photo Station. National Film Board of Canada. Photothèque / NAC / C-084261 Station and Highland Inn. 1907-12 NAC / Col. RG30M Acc. 78903/42 Item 7 G.T.Ry. Proposed station. Plan. Section. Front, rear and side elevations. 1916-03-10 NAC Col. RG30M Acc. 78903/42 Item 8 G.T.Ry. Proposed guide house. Plan. Section. Front and side elevations. Details. 1953-12 Wilson-2007, p. 189 C.N.Rys. Operating diagram.